GM Free Me is a visual petition. It’s an alternative ‘national portrait gallery’ made up of real people who are tired of politicians and regulators playing with our food whilst accepting no responsibility for the consequences of the game. The pictures here, and the people who take part, are telling the compelling story of the UK, which has for 20 years stood strong against immense industry pressure to become a GM nation and which still has regions, cities and local councils that have declared themselves to be GM Free. With your support we can continue to stand strong. We can raise the level of this debate so that we can enable everyone with concerns about GM to be seen, heard and listened to. Uploading your photo is easy and once you do it will quickly go into our gallery. But it will also go onto a map of the UK divided into political constituencies. The more of you in each area, the more power you have and the more pressure we can all bring to bear locally and nationally. We know you are out there – and you’re not on your own. Public opinion has kept genetically modified (GM) crops and foods out of the UK for nearly 20 years. Poll after poll has shown that people in the UK want this country to remain GM Free. We don’t want it in our fields and we don’t want it in our food. But now the UK government has stated its intention to ignore public opinion and press ahead with the contamination of our fields and the adulteration of our food supply with a high risk technology that offers no significant advantages but carries significant risks for farmers, the environment, food security and human health. Which is why we all need to send a strong and personal message that this is not acceptable. 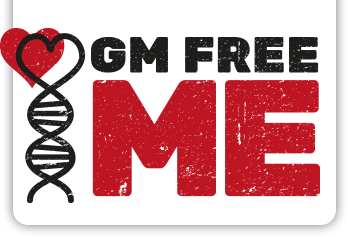 GM Free Me launched in 2014 when there was an national election on the horizon. The issue of GMOs wasn’t included in the main party manifestos and neither the Government nor the main opposition parties wanted to discuss it. In the pre-Brtexit era not much has changed. Then and now, the future of our food, our health and the health of our environment is being decided in back rooms with the ‘help’ of faceless lobbyists from large biotech companies and the scientists in their pay. The voices and faces of the average people and even dissenting scientists are not present and not accounted for. We want politicians, regulators, rent-a-quote scientists, industry lobbyists to stop pushing GM crops and food at us. We want them to look us in the eye, to listen to and take seriously the many, and very serious, concerns about the failure of GM to deliver on any of its promises and the risks that it poses to us all. We want everyone to be seen and heard. Your opinion matters, your concerns are real and valid and with just a couple of clicks you can be a force for positive change in the UK.